Unfortunately an appalling photo of Harry taken in the Den in 1972 in the week after it opened. The write-up says: Things are hotting up down in the Devil's Den as the mysterious Mad Harry makes merry and sends his followers into a wild frenzy. 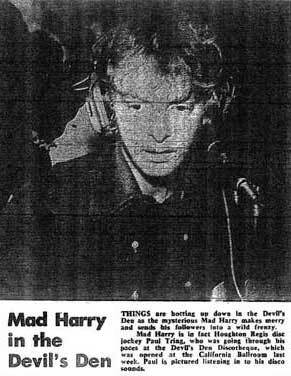 Mad Harry is in fact Houghton Regis disc jockey Paul Tring, who was going through his paces at the Devil's Den Discotheque, which was opened at the California Ballroom last week. Paul is pictured listening to his disco sounds. Paul Gray played the first record in the Den. The doors opened to Honky Tonk by James Brown. The evening the above photo was taken, Harry, wound things up by pouring his beer all over the decks. Harry is alive and well and still living in the area.